This is such a great posts, these pictures are amazing!! Both those outfits are lovely! I love these photos and the outfits! Your blog is really adorable! Favorite on this post: the watches! These pics are truly amazing...she looks like a vintage dame of the early 60s...great hair, great posture, great pictures! 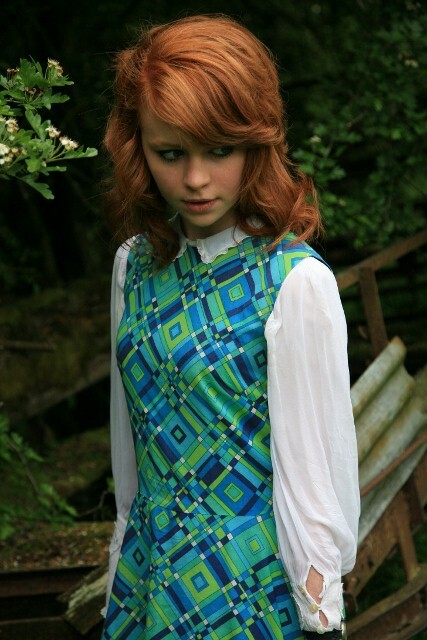 Great sixties vibe in the outfits! I love how vintage-y this post is! all those trunks and watches are incredible. great post, girrrrl! Fabulous pictures, lovely colour contrasts, well done! better late then never, happy blogbirthday! how fun! im really loving those boots! ;) your friend is really pretty! do you like van gogh's paintings? impressionism & his paintings are some of my favorite. lovely photos!!! I really like the color f that dress! Very cool, love the photos, the model, and all those watches! perfect styling and photography as ever. I have a bit of an isse with fabric belts, I always remove them and only ever wear them with differnt unmatching dresses, so I love what you have done here. Gosh Fashion East I still can't decide who to nominate, so perhaps I will just vote for other instead! Also, both you and Emma have amazing hair! So jealous! I love you style. you are so beautiful! I love your photos and the model! I love the 60's photos .... she looks so perfect, just like an old film! Love the photos. Keep them coming! I love the blue and green dress outfit with all the cases so very 60's. Its great. You are a very good stylist and photographer (as well as model and writer!). Her colouring looks beautiful with the green dress! But I especially love the second ensemble... 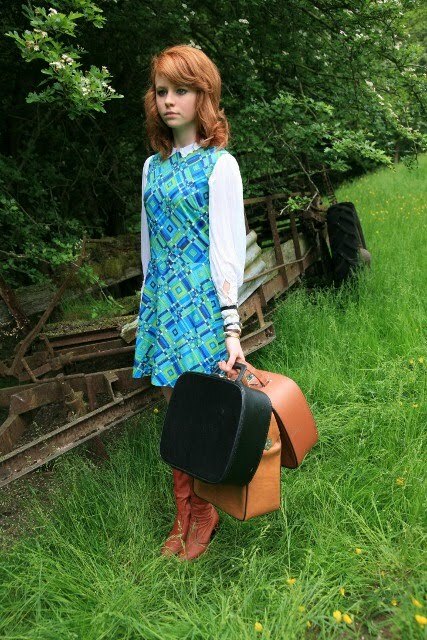 The vintage suitcases are gorgeous and the geomentric bright retro dress wonderfully contrasting with the white soft blouse - I love the collar! Those pictures are simply stunning! Same goes for the outfits, so lovely! omglove the pic of all the watches! this is great so editorial looking! enchanting pictures! both outfits are so wonderful! i love the second one the most, however: the arm of wristwatches is lovely. Umm hehe can I have all of your watches? I especially love the big faced one on the end! yay, it's emma! 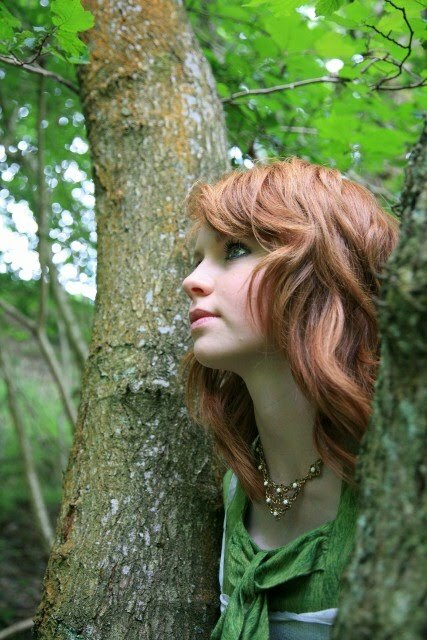 :) these photos could be straight out of a storybook. i especially like the green dress with warm brown boots. i love the last photo of the wrist with all the watches, im currently wearing 3 watches none of which work and all stating a differnt time, the thing is i always forget that they dont work and have a mini freak out that im alwys seriousy late! my favorite part in every picture, are the boots! amazing! You are great behind the camera as well as in front of it! Gorgeous photos, Emma looks amazing. I particularly like the second dress and I love the picture with all the bags. wowowow! I love the image of her holding the three suitcases. It looks just like an image from an editrial or look book, its so mature. I adore her outfit, it goes perfectly with her hair! 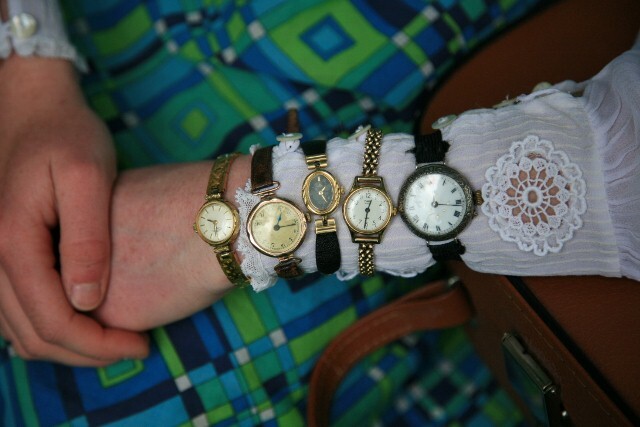 How funny, ive just done a post where I put on all my grandmas vintage watches on at once like you did! Love the action in the first photo -- shows off the boots so well.